This website displays an extensive range of maps, which you may purchase personal copies of, in a variety of formats. When viewing a map, look out for the Order this map button on the map menu bar. 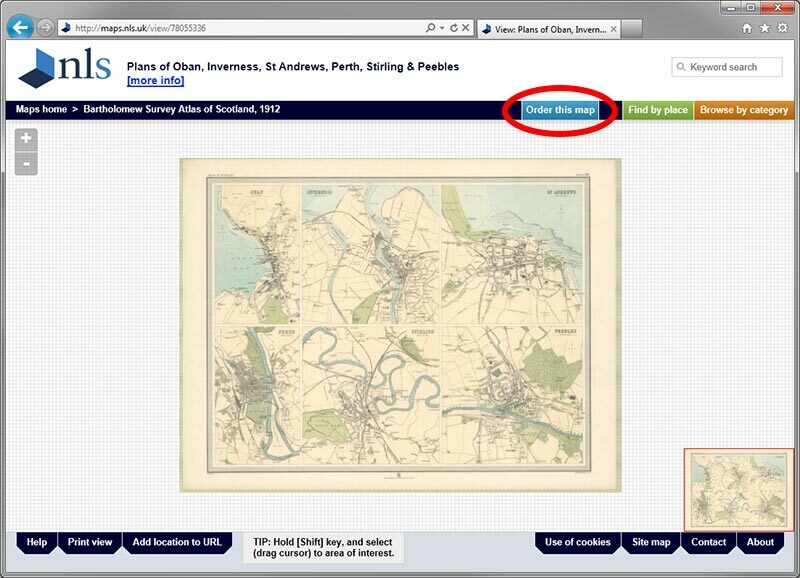 Select this button to add the map to your shopping basket. Following the selection of a map to order, a shopping basket will then display a list of maps you have added. Select the item type that you require from the drop down list next to each map title. This will allow you to choose your order format (eg. print or photocopy, and size). After selecting a map item type, proceed to select the Update totals button. After selecting the Update totals button, you will note that the total cost of your order has now been calculated. Please note that this interim calculation assumes that your order will be delivered by post to an address within the United Kingdom. However, if your order is to be delivered outside the European Union, then you will not incur any sales tax (VAT) charges. Additionally, if you elect to collect your order directly from Library premises, then you will not incur any postage and packing charges. If you aren't liable to incur either of these charges, they will be deducted from your order prior to making payment. Please note that the postage and packing charge is a flat fee regardless of the number of items in your order. If you plan to order more than one item, you can minimise your postage and packing charges by placing all your items in a single basket before checking out. 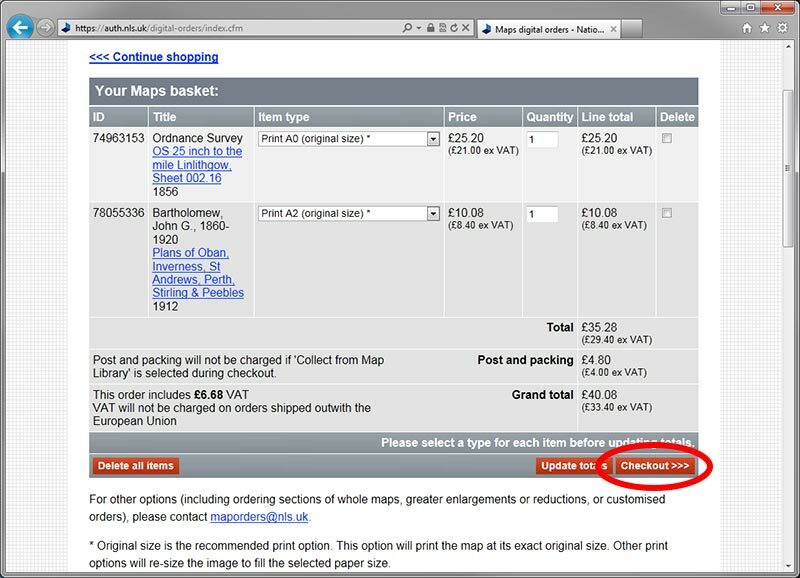 Just select the 'Continue shopping' link (or use your browser’s back button) to return to the Map images website and continue adding further items to your basket. When you are ready to pay for your order, return to your order basket via the 'View basket' button on the map menu bar, and then select the Checkout >>> button to proceed. 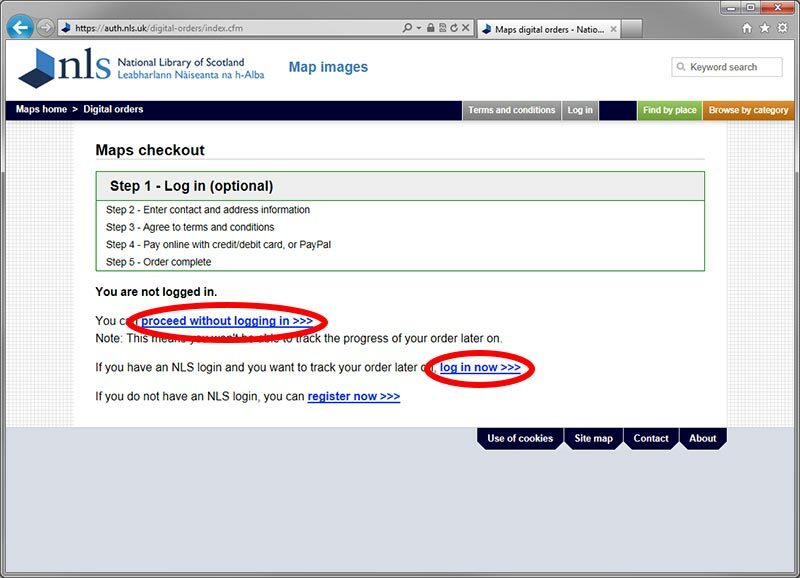 In Step 1 of the checkout process, select the log in now >>> link, should you already have an NLS login. This will pre-populate your personal details in the next step of the checkout process, and enable you to track the status of your order later. Alternatively, you may proceed without login registration, by selecting the proceed without logging in >>> link. 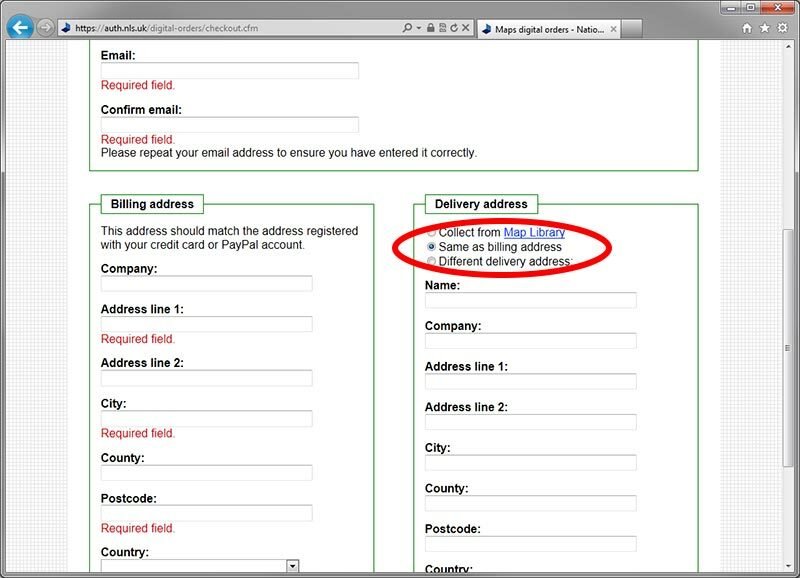 Step 2 of the checkout process allows you to supply contact details and select your preferred delivery option. You may choose to have your order delivered to your billing address, or enter a different delivery address. Alternatively you can choose to collect you order directly from the Library (thus avoiding all postage and packing charges). Step 3 of the checkout process asks you to agree to our terms and conditions. Select the terms and conditions link to read them (the terms and conditions may open in a new window or tab). 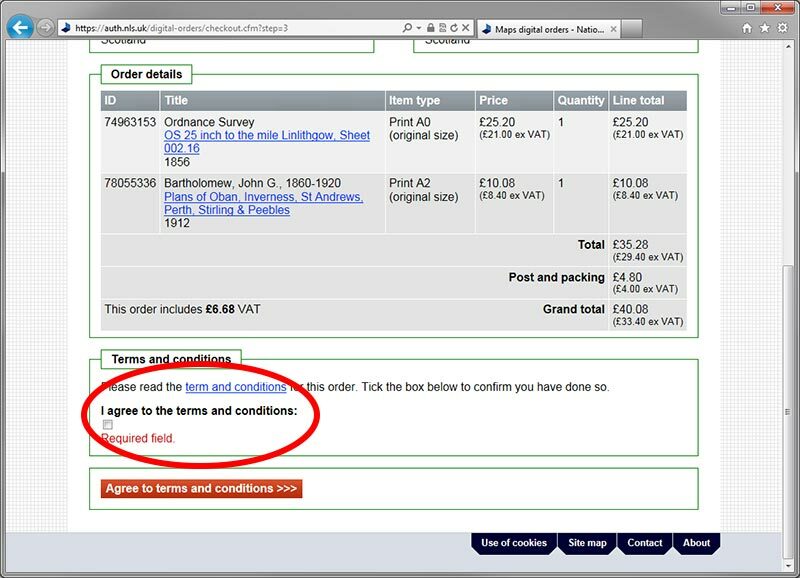 Tick the checkbox and then select the Agree to terms and conditions button to agree and proceed. Step 4 of the checkout process allows you to review your order details before proceeding to make payment. When you are ready to pay, select the Pay Now button. 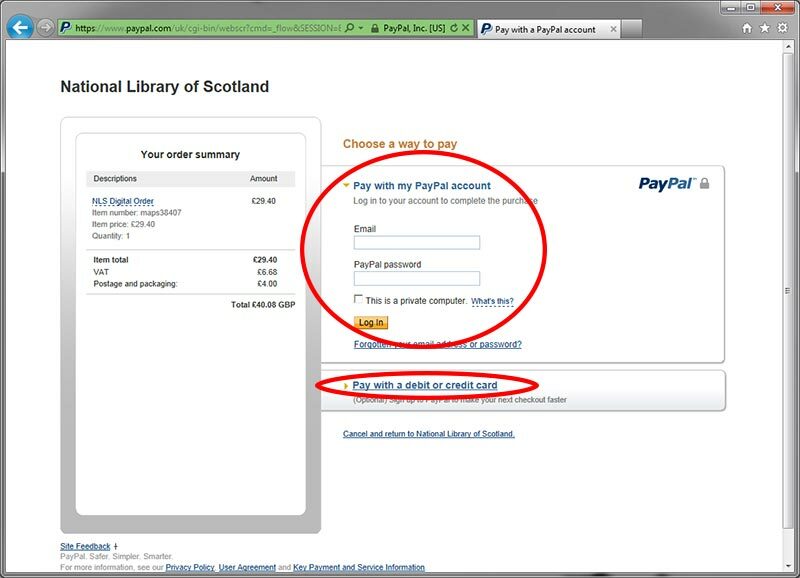 This will take you to the PayPal payment gateway, allowing you to make payment securely. Please note that a PayPal account is not required. You may pay online using Visa or Mastercard, without opening a PayPal account. 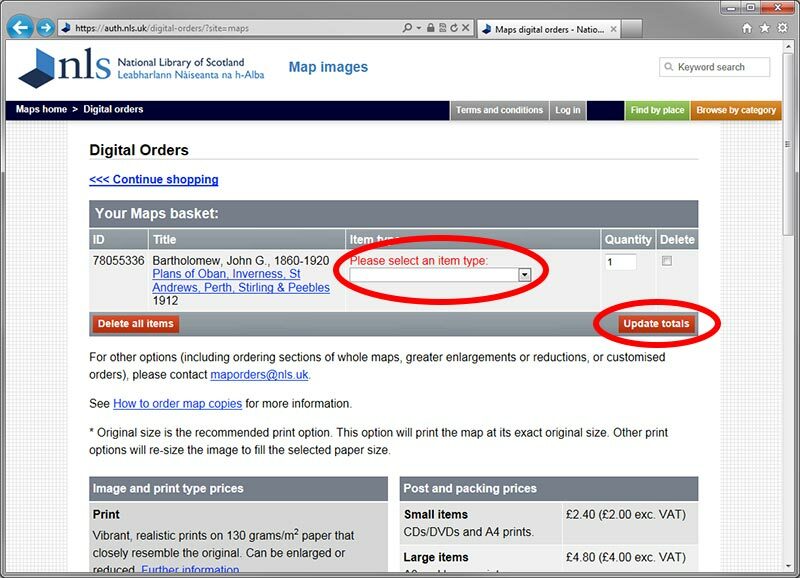 Further information on how to order map copies by credit or debit card without a PayPal account. After you have finished paying for your order, you will be returned to our website. You will receive an email from us confirming your order. This email will include your map order number, which you should quote in any subsequent queries about your order. 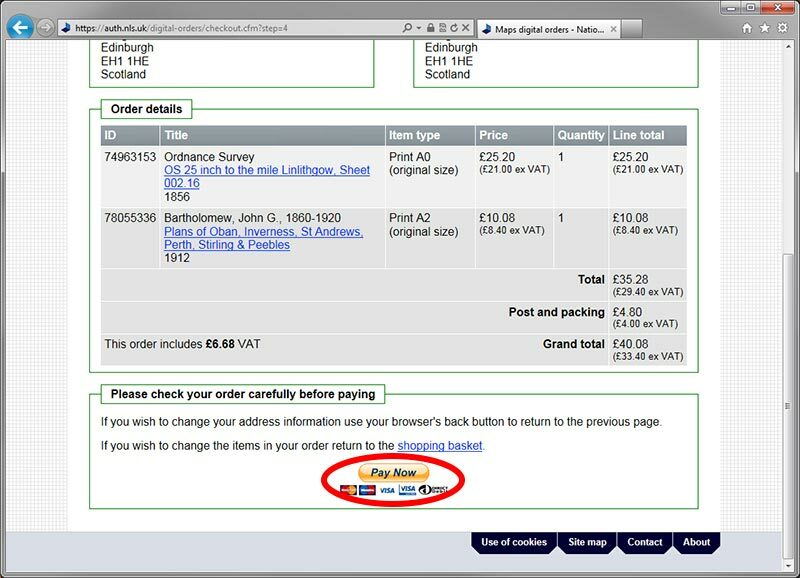 You will receive a further email to inform you when your order has been dispatched, or is ready for download. If you chose to collect the order directly from the Library, you will receive a further email to advise you when your order is ready to be collected. Please note our Maps Reading Room opening hours.